Offering in-house dialysis for residents improves the quality of their life. As quality of life improves, residents increase their fulfillment and functional ability. Skilled nursing facilities strive to provide the highest quality of care, and offering in-house dialysis is another step towards improving the lives of residents. North Shore Healthcare supports continuing education for nurses in the skilled nursing industry or for those that wish to enter the field. North Shore partnered with the Wisconsin Director of Nursing Council to match dollar for dollar, up to $5000, funds raised during the Council’s annual nursing symposium and expo held February 25-27, 2019 at the Grand Geneva Resort in Lake Geneva, WI. The raffle raised $4360, which combined with North Shore’s match, brought the total to close to $9000 in nursing scholarships. Eight $1000 scholarships will be given to students pursuing a career in the long-term care continuum. “North Shore Healthcare is excited to help sponsor the 2019 scholarships awarded by the Council to nurses in long-term care. One of our organization’s core values is competence, and we believe in supporting our nurses in furthering their education to ensure the best possible care is given to our residents. We are equally supportive of all nurses and individuals who want to continue their education or enter the field of long-term care. By matching dollar for dollar the amount raised by the raffle for the scholarships, we are doing our part to assist those who are as passionate about long-term care nursing as we are,” said Dee McCarthy, Chief Clinical Officer at North Shore at the time of committing to the match. The Wisconsin Director of Nursing Council is a non-profit association that provides education and support to nursing leadership in the long-term care continuum. The annual Long-Term / Post-Acute Nursing Symposium is in its 26th year and brings together Directors of Nursing and other nursing leaders and executives from around Wisconsin. Click here to read the press release from the Council. 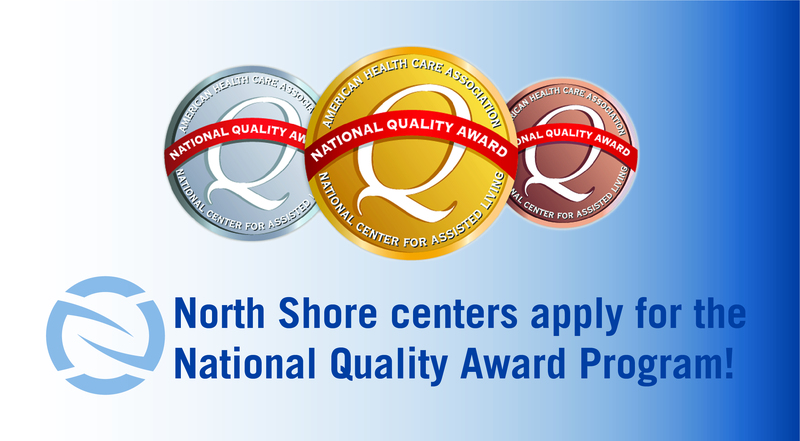 In pursuit of quality improvement and enhancing the care provided to our residents, 29 North Shore Healthcare skilled-nursing facilities submitted applications for consideration to the AHCA/NCAL Quality Awards Program. Among the 29 applicants, one is seeking recognition for a Gold Quality Award, one for Silver Quality Award, and the balance for Bronze. Executive Directors from these centers began the process when they were confirmed by AHCA/NCAL of their eligibility to apply for the Awards. In early December they came together for a workshop that assisted them in completing the complex written application. After a month long process of writing and reviewing applications, they are all in and North Shore awaits the announcement of the Quality Award recipients in late Spring 2019. The AHCA/NCAL National Quality Award Program provides a pathway for providers of long term and post-acute care services to journey towards performance excellence. Member centers may apply for three progressive levels of awards: Bronze—Commitment to Quality, Silver—Achievement in Quality, or Gold—Excellence in Quality. Each level has its own distinct rigors and requirements for quality and performance excellence. Applications are judged by trained Examiners who provide feedback on opportunities for improvement to support continuous learning.